G. J. Schnatz was George J. Schnatz (1855-1933), an immigrant from Bavaria, whose iron foundry was located at 2343 Old Broadway approximately 1905 to 1913. Prior to 1905, 2343 Old Broadway was the home of an iron foundry owned by Edmund L. Pollock. More about Pollock and the street called Old Broadway can be found on the Pollock Page. Around 1913 buildings on Old Broadway were renumbered, and the Schnatz foundry became 38 Old Broadway. This ad for the George J. Schnatz Iron Works appeared in The Horace Mannikin, 1937, published by the Senior Class of Horace Mann School for Boys. Earlier George J. Schnatz was in partnership with Charles Massoth (1859-1932) as Schnatz & Massoth. The Schnatz-Massoth partnership lasted approximately 1888 to 1905. In 1905 the Real Estate Record and Builders' Guide, 6 May 1905, pg. 992, announced, "The firm of Schnatz & Massoth, structural and ornamental iron workers, of 427 East 76th st, has been dissolved by mutual consent. Mr. George J. Schnatz, of the company, has established himself at No. 2343 Broadway, near 129th st, in the building formerly occupied by the E. L. Pollock Iron Works. Mr. Schnatz is an iron worker with many years' experience, is well known in the building trade, and should meet with success." Several sources cite contracts awarded to G. J. Schnatz for iron work, including the Park & Tilford store at Madison Ave. & 46th St. (1914), an apartment building designed by Schwartz & Gross at Lexington Ave. and 79th St. (1916), the Albany County Court house in Albany, NY (1916), and alterations to the building at 149 E. 78th St. (1918). Two of George J. Schnatz's sons followed him into the business. These were Frederick Schnatz (1889-1925) and Henry Schnatz (1888-1967). The elder Frederick Schnatz died suddenly from an accident in 1925. As reported in the New York Times, 15 Aug. 1925, pg. 11, "Schnatz - Frederick, in his thirty-fifth year, suddenly, by accident, on Aug. 14, dearly beloved husband of Helen Schnatz (nee Hausermann), father of Evelyn, Helen and Frederick; he is also survived by his father, George J., and mother, Louisa; brother, Henry; sisters, Amelia Stock and Anna Meyer. Funeral services will be held on Monday evening, at 8:30, at Funeral Parlor, 1,093 St. Nicholas Av., between 164th and 165th Sts. Interment on Tuesday, 10:30 A. M., in receiving vault, Lutheran Cemetery. Freundschaft Bund and York Lodge will please take notice." George J. Schnatz's death notice, New York Times, 14 Jan. 1933, pg. 13, read, "Schnatz - George J., on Thursday, Jan. 12, at his home, 1,491 East 18th St., Brooklyn, beloved father of Mrs. Anna Meyer and Henry Schnatz; also survived by five grandchildren. Relatives, friends and members of socrates Lodge, F. and A. M.; Beethoven Maennerchor Plungstadter Krankenunterstuetzungs-Verein, Freundschafts Bund, K. U. S. V.; Runder Stammtisch, P. J. Hoellerer Benevolent Association are invited to attend funeral services at his home on Sunday, Jan. 15, 8 P.M. Interment on Monday at 2 P.M. Lutheran Cemetery." In the early 1940s the Schnatz foundry left Old Broadway in Manhattan and became Schnatz-Ogle Iron Works at 891 E. 135th St. in the Bronx. Henry Schnatz registered for the World War II draft in 1942, age 53, born 9 Nov. 1888, New York City, when he was employed at Schnatz & Ogle, Inc., 891 E. 135 St., New York City, NY. This business closed in 1964. 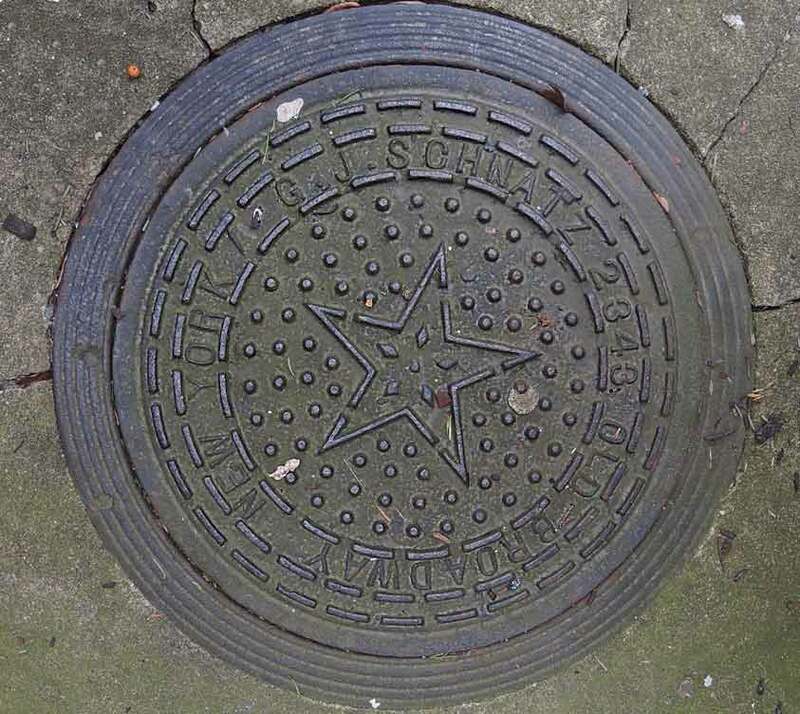 Another G. J. Schnatz coal chute cover is found on Morris Ave., the Bronx, near East 179th St.